Are you ready to develop the creative and critical thinking skills you’ll need to make the future catch up to you? and, international affairs, professional management and environment, urban and public policy, media and communications, creative writing and teaching English to speakers of other languages. We prepare you to be an agent of change by equipping you with the scholarly knowledge and practical tools to take on the complexities of a future that doesn’t even exist yet. 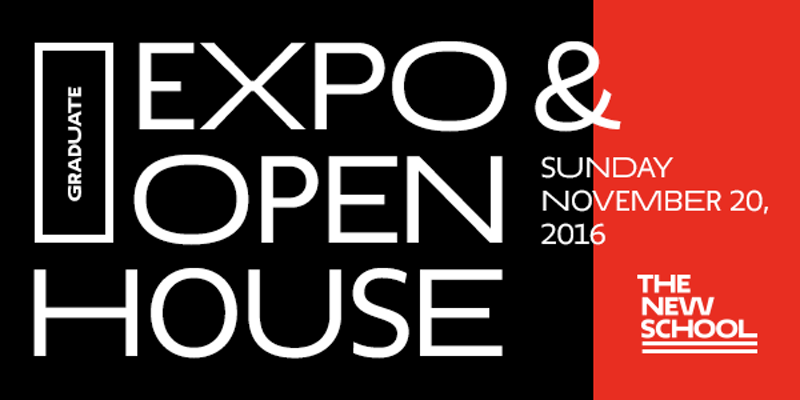 We invite you and your family to explore our graduate programs at our Graduate Expo & Open House on Sunday, November 20, 2016! Programming begins at 10:00 a.m. at the University Center at 63 Fifth Avenue. Registration begins at 9:00 a.m. Admission counselors, financial aid representatives, current students, and faculty members will be on hand to answer your questions about the admission process, academic scholarship, student life, social engagement and the range of career opportunities that await you after graduation. Join us for an insider’s look at an education defined by unfiltered debate, design-inspired thinking, and visionary artistry, where active learning and immersion in the latest ideas and practices combine to produce a university experience like no other. Not in NYC? Join the Livestream! If you cannot come to campus, join us as we stream the opening session, featuring an introduction to our graduate programs by our school deans, and remarks from staff, faculty and alumni. Livestream registration coming soon! Check out this video from our 2015 Grad Expo & Open House!